This is my last week of grad school. I'm celebrating with full-on eighties high school movie nostalgia mode. Therefore, I'm posting the best ever eighties movie credits song. 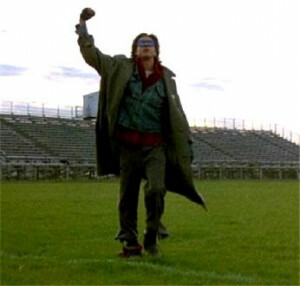 "Don't You Forget About Me" by Simple Minds. This song is double the wonderful because the lead singer of Simple Minds reminds me of Rick Moranis, who I am not so secretly in love with AND it's associated with one of the best movie characters ever "John Bender" from The Breakfast Club. Who also reminds me of another lovable rebel, Futurama's robot Bender. But I could go on like this forever. It should be noted that this is one of a handful of songs I always play on the jukebox at my favorite Muncie watering hole "The Heorot". This, "Head over Heels" by Tears for Fears and any of a handful of Talking Heads songs. My song selections typically thrill half of the pub while the other half shoots me eye daggers and emits an audible groan. Let the week of nostalgia roll forward. Here's to my last ever graduation! I'll also be watching "Say Anything", "Can't Hardly Wait", and "Pretty in Pink". What are some other great end-of-the-year/graduation movies that might be fun to add to the list? And yes, I know I'm thirty so it's not the same. But I party my way.